37 cm tall (14.5 inches). 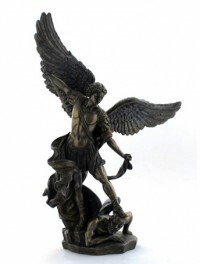 Archangel Michael standing one foot on Lucifer's (in human form) head, holding him to the floor. Bronze-finish guardian angel warrior. Field commander of the Army of God; Sword and shield ready to cast down the darkness.